Just behind the Large Theatre there’s the Temple of Isis with its entrance in the street of the same name. Originally dating from between the late 2nd and early 1st centuries B.C., it was totally rebuilt after the earthquake of 62 A.D. at the expense of an ex slave who had since made his fortune. The cult of Isis became fairly wide spread during the Hellenistic era due to the religious links the Greeks had with Egypt and the Orient, and it had a particularly large following in Pompeii as the town has strong trading ties with the East. The temple stands on a tall podium situated in the centre of a porticoed courtyard. The cella, which is greater in width than in length and can be reached by means of stone stairway to one side, is situated behind a portico with four columns to the front and two niches for the statues of divinities from the cult of Isis. Behind the temple there is a large meeting room which was probably used during preparation for the rites. Excavation work between the entrance columns unearthed a marble hand, a golden goblet, a statuette, two bronze candlesticks, and two human skulls, which were probably used in cult rituals. To the sides of the room there are two other rooms which were obviously connected with the cult as four wooden statues with marble heads, hands and feet were found in one of them. In front of the temple in the left-hand corner of the portico we find a room that was designated for purification ceremonies where water from the river Nile was kept in containers in the basement underneath. 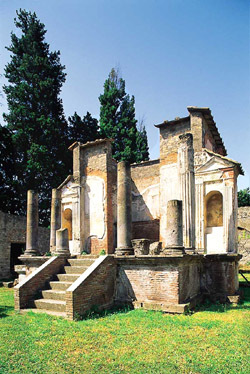 The main altar is situated between the temple and the purgatorium, while the others are generally located between the columns. All the finds from the temple as well as the decorations removed from the walls are exhibited in the National Archaeological Museum in Naples.